Last year marked the 25th anniversary of the fall of the Berlin wall. In this context, post-communist Bulgaria met the date with a brand new generation blind to the past, as well as with an economy and society connected with the Western world more than ever before. A reputable sociological agency (Alfa Research Ltd, Nov. 2014), however, published a report that aroused the spirits. It showed that more than 50% of the sample expressed a clear nostalgia for the ‘old times’, caused mostly by being tired of waiting for some ‘better future’ which never happens. Taking a look back at the history, the first elections after the changes – those in mid-1990 – were won by the Bulgarian socialists, the nearest heirs of the former communist party. That made Bulgaria the only country among the others from the former socialist block giving the power to the same body of politicians as before November 1989. Moreover, it revealed that obviously the ordinary people had not been prepared for these significant changes, as had happened in most other central European countries, either in terms of institutions or everyday life. People tried to maintain the status quo probably because they didn’t know anything else as a political program at that time, except for some vague idea of privatised economy – and the future seemed too unclear. The data in the report also demonstrated that a positive attitude towards the former communist leader, previously an object of comedy and of fear, increased threefold between 1991 and 2014. The sectors showing remarkable decline during the transition period were health, education, and security systems as well as the economy in general. Only the freedom of the media and infrastructure improvements were perceived as positive outcomes of the new political and economic direction. Generally speaking, exactly half of the respondents, both from the left and the right wings of the political spectrum, considered the transition period so far as unsuccessful. All the findings in the report in question were more than curious and in cultural perspective it seemed useful to put Lotmanian semiotics into action (also known as the concept of the semiosphere) to try to reveal how the former socio-economic regime in Bulgaria and the way of living attached to it are presented in the cultural landscape of today. In brief, leading principles of the model include the dynamics within the system which bring about asymmetry and some kind of a constant (collective) memory play. Its main elements are the core of the dominant cultural paradigm (grammar) and periphery (or the sum of weaker, subordinate fields in the cultural system). Since in the first decade of post-socialism no new strong ideological center appeared and the logical outcomes were were the disunion in local culture (values, heroes, goals, aesthetics, etc.) and a constant collision between the peripheral zones, on the one hand, and a need to re-read the near past on the other. At the same time the boundary (i.e. borders of the semiosphere) was too permeable, and thus it supported not one new core formation but, rather, several different potential formations – which rendered the system as a whole unstable. 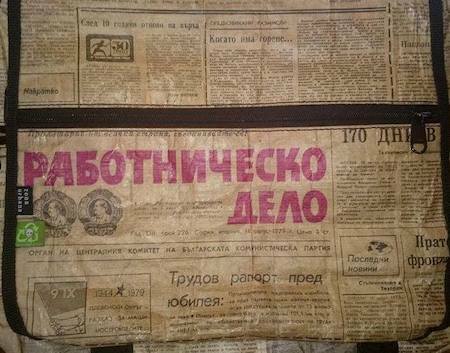 Front page of Communist party newspaper, from late 1979, woven into urban lifestyle bag. Nowadays the set of sign systems created within Bulgarian socialism – especially in its late period – lives a new life in various forms, in various places, bearing some new meanings which represent it as a semi-imaginary/semi-real cultural construction. The complex and simultaneously obscure system of meanings and influences of this heritage could be ‘read’ in different pop-cultural visual, musical, architectural and verbal texts – literature, music, films and even bars/restaurants. The elders may perceive the pop-cultural referencing of socialism as offensive and partial, while the youngsters have highly mediated impressions of it. In their eyes it is a set of texts which seem more like a mosaic resulting in a form of fairy-tale of how the anachronistic evil got beaten by the progressive part of the people and the logic of freedom of choice, speech and consumption took over. Alongside some retrospective commentary web-sites (for instance http://socbg.com/) in the capital Sofia recently have popped up places like rakia bar Raketa” (=Rocket), its interior stocked with emblematic products from socialist every day life (even a vacuum clearer) and the Museum of socialistic art, which collected political signs, small monuments and other propaganda artifacts. In this perspective socialism may be seen as a good business/marketing tool, recycling material culture from that time – which may still be sourced relatively easily which is partly why it can connote authenticity) in a harmless and strongly contextualized ambience (see the illustration). The past is displayed as stripped back to essentials. Eventually, some paradoxes do become apparent in the social-cultural mix. Parts of the population do not want to remember Socialism at all, while a lot of people want it back, even if not exactly in its previous reality. But for those who barely knew it, socialism comes back via its material and commercial face (we could add here T-shirts with signs such as ‘USSR’ and ‘KGB’ on them as well). This case is an example of how old cultural texts can come back re-coded (from the periphery) and demonstrates how tricky the culture, in terms of ‘common memory’, actually is. Culture, just like its non-semiotic opposition – Nature, does not support empty spaces, except for perhaps some some thinner zones from time to time. When certain myths disappear they should be replaced, otherwise history come back through a boomerang effect in different and very often crooked forms. You are currently browsing the Semionaut blog archives for May, 2015.